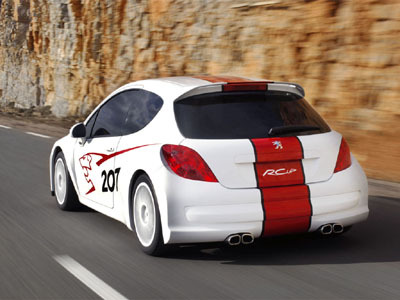 The Peugeot 207 RCup concept, like the 205 Turbo 16 and the 206 WRC did for their siblings, supported the production 207 on its launch, providing a source of inspiration for prospective buyers, as well as racers. 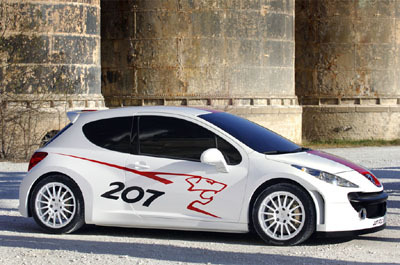 Styled by the Peugeot Style Center, the 207 RCup highlights the sporty side of the production 207. The full bodykit, with wider arches and more aerodynamic front and rear facias, suits the car from all angles, and with the racing stripe and lions head graphics the RCup is achingly beautiful, for a hatchback. 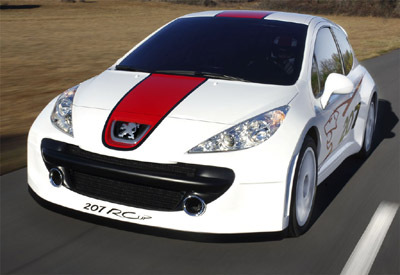 Powered by a 2.0 litre naturally aspirated petrol engine, with a power output of approximately 280 bhp @ 8,500 rpm, as dictated by Super 2000 Rally regulations, the Peugeot 207 RCup is race ready, down to the interior complete with rollcage, racing bucket seats and four point harnesses.